"The vanilla orchid is not a showy flower; it has only a slight scent, with no element of vanilla flavour or aroma... The growing process lasts up to nine months, but only when the pods turn brown after being dried and cured do they develop the distinctive aroma we call vanilla." "The Aztecs, like the Maya before them, knew that the black pods could be dried and ground up as flavouring for xocoatl, the bitter liquid made from cacao, which we know today as chocolate. It was a drink reserved for the aristocracy, or for soldiers about to go into battle." "The vanilla story begins in the salt-thick air of Veracruz. Here, the first vanilla plants were cultivated and tended by the people who called themselves Totonac. These people found the wild orchids and called them xa'nat. The Totonac say that the flowers and their scented seed pods sprang from blood. Not just ordinary blood, but the blood of a princess who was so beautiful and so pure in spirit that her father decided she would never be possesed by any mortal man... According to the legend... Princess Tzacopontziza and her lover committed a mortal sin, and the priests decapitated them both... after some days a bush sprang from the ground where their blood had spilled. Very soon an orchid was seen growing among its branches. The plant grew... When the beans matured they darkened, eventually emitting an exquisite perfume more beautiful than anything the subjects of King Teniztli had ever known before. People believed that the scent was the pure sweet soul of the dead Princess and the orchid that grew in the mountains was declared sacred." "More than half of all the world's vanilla beans end up in the United States." "That's just cosmetic... It's just a marketing thing; sometimes they don't use the seeds just tiny specks of exhausted beans." 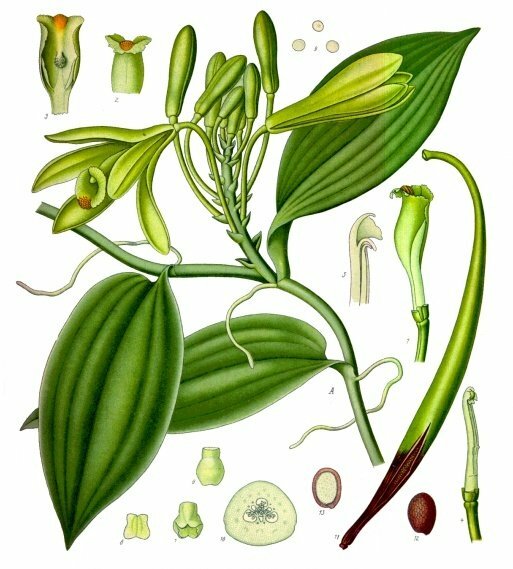 "There are more than a hundred different species of vanilla orchid, and they grow all over the tropics with the exception of Australia... but only a few species bear the large aromatic pods which can be used commercially." "At the end of her life. Queen Elizabeth I developed a taste for puddings containing vanilla." "Vanilla planters cannot rely on natural pollinators to fertilize their orchids. They must do the job themselves." "If legend is to be believed, Cortés became the first European to taste vanilla, an ingredient in xocoatl, which Moctezuma presented to him in a gilded goblet carved from tortoiseshell."